Elizabeth (Fletcher) Keyes (1720-1761) is #147 on my Ahnentafel list, my 5th great-grandmother, who married #146 Jonathan Keyes (1722-1781) in 1746. * their daughter, #73 Elizabeth Keyes (1759-1793) who married #72 Zachariah Hildreth (1754-1829) in 1777. * their son, #36 Zachariah Hildreth (1783-1857), who married #37 Hannah Sawtell (1789-1857) in 1810. * their son, #18, Edward Hildreth (1831-1899), who married #19 Sophia Newton (1834-1923) in 1852. * their daughter, #9 Hattie Louise Hildreth (1847-1920) , who married #8 Frank Walton Seaver (1852-1922) in 1874. 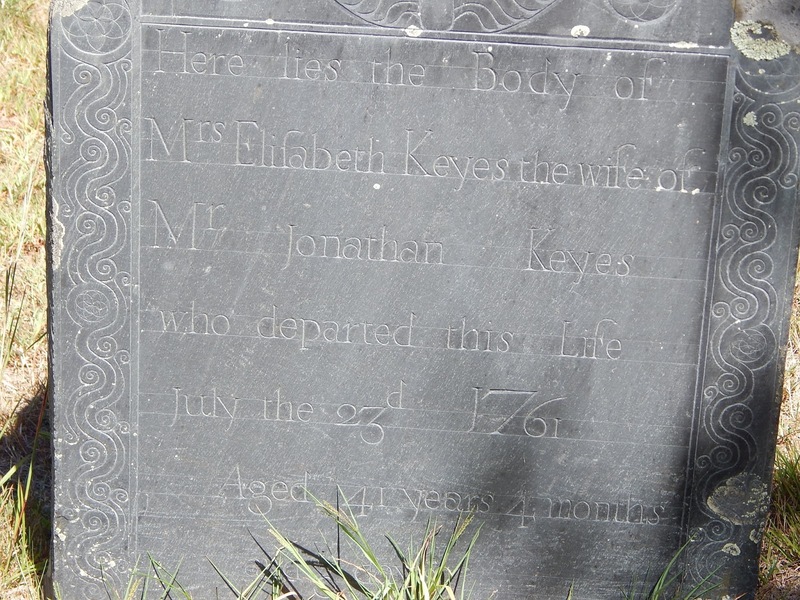 Fletcher born March 9th 1719+20"
"1746 Jan 20 Jonathan Keyes to Elisabeth Fletcher both of Westford"
Hannah Keyes daughter of Jonathan Keyes and Elisabeth his wife was born May 7, 1761"
Three of her children, Joanna (the first one), Aaron and Stephen, died as small children. Elisabeth Keyes died soon after the birth of her seventh child, Hannah. She left four children aged 15 years, 4 years, 2 years, and 1 month old. "KEYES, Elisabeth, w. Jonathan, July 23, 1761, a. 41 y. 4 m 3 d. G.R.1"
aged 41 years 4 months." 1. Massachusetts, Town and Vital Records, 1620-1988, digital images, Ancestry.com (http://www.ancestry.com), "Chelmsford Births, Marriages and Deaths," image 384 of 1719, Elizabeth Fletcher birth entry. 2. Town of Chelmsford, Massachusetts, Vital Records of Chelmsford, Massachusetts to the Year 1850 (Salem, Mass. : The Essex Institute, 1914), Births, page 63, Elizabeth Fletcher entry. 3. Massachusetts, Town Records, 1620-1988, digital images, Ancestry.com, "Westford Births, Marriages and Deaths," page 41 (image 267 of 1750), list of children of Jonathan Keyes and his two wives. 4. Vital Records of Westford, Massachusetts to the Year 1849 (Salem, Mass. : The Essex Institute, 1915), Deaths, page 293, Elisabeth Keyes entry. 5. Jim Tipton, indexed database, Find A Grave (http://www.findagrave.com), Fairview Cemetery (Westford, Mass. ), Elizabeth Fletcher Keyes memorial # 36127440. 6. Massachusetts, Town Records, 1620-1988, digital images, Ancestry.com, "Westford, Births, Marriages and Deaths," page 53 (image 33 of 1750), Jonathan Keyes and Elisabeth Fletcher marriage entry. 7. Vital Records of Westford, Massachusetts to the Year 1849, Marriages, page 194, Jonathan Keyes and Elizabeth Fletcher entry.